Holiday at peaceful Madora Bay. 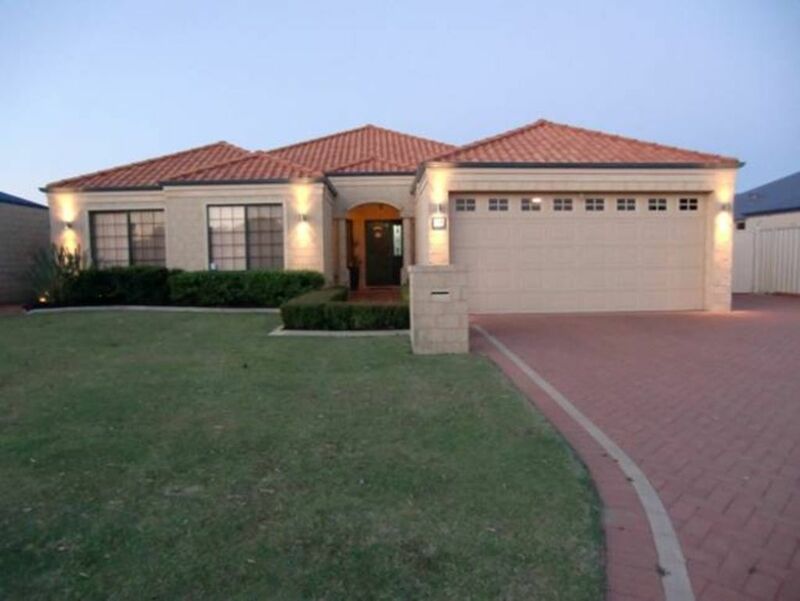 Immaculately presented R/C Air-Cond executive home. Only 250m (2 minute stroll) to beach. Home comprises 5 bedrooms (B1-Queen, B2-Queen, B3-Queen, B4-King Single, B5-Double), 2 bathrooms, Large open plan kitchen, dining, living and entertainment areas. Separate theatre/tv room with TV, DVD, Foxtel and Stereo together with a wide selection of DVD's. Fully equipped modern kitchen, Microwave, Dishwasher, Fridge/freezer, All fridge, Dining setting for 10-12, Ducted reverse-cycle Air-conditioning, Gas BBQ, Outdoor Alfresco area with setting. Washing Machine and Dryer. Hard stand area for boat or trailer. Large grassed and secured back yard. Ideally suited for single or dual family accommodation. This property is located in a residential area. Your consideration of our neighbours is appreciated. ***Linen included - confirmed numbers required at time of booking*** ***We do not accept bookings for groups aged under 25 years of age*** ** No Schoolies ** No Pets ** NO SMOKING INDOORS ** No Hens or Bucks nights ** No Parties ** Minimum Stays: Long Weekends - 3 nights, Easter - 4 nights, All others - 2 nights (except Xmas / January - 7 days). ** All Long Weekends - $900 ** ** All other Weekends (High season) - $700** **Weekends deemed as Fri/Sat nights or Sat/Sun nights** **All Other 2 night stays are charged at $275 per night during Low Season ** *** Xmas / January bookings - Minimum 7 days ***BOOKING REQUESTS MUST BE MADE AT LEAST 7 DAYS PRIOR TO STAY TO ALLOW US TIME TO PREPARE THE PROPERTY FOR YOUR VISIT BOOKING FEE: Our normal terms are $500 deposit paid at time of booking. The $500 is used as a Deposit/Security/Cleaning bond when you eventually take possession of the property. The 'Security/Cleaning bond' is refunded in full after check-outPROVIDED THE PROPERTY IS LEFT IN THE SAME CONDITION IN WHICH YOU FOUND IT. Location Madora Bay is 70 klm south of Perth City Centre - 50 minutes via the Kwinana Freeway and 5 minutes from Mandurah town centre and boat ramps. Open parkland directly across the street. Meadow Springs Shopping centre is close by comprising fast food outlet (Red Rooster), Coles, Target, Bakers Delight, Newsagent, Chemist, Video/DVD Hire, Tackle Store, Liquorland, Clothing & Homewares Stores, Hairdresser, Service Station and the like. The world class Meadow Springs Golf Course is also only 5 minutes away. Local Attractions Clean beaches ideal for swimming, body boarding & fishing, Crabbing, Marina, World class Golf Courses, Dolphin cruises, Charter Fishing, Restaurants, Cafe's, Shopping Centres, The Boardwalk Reading Cinemas and Mandurah Performing Arts Centre, Fun Park, Mandurah Greyhounds, Wineries. The house was very well looked after, nice and clean. You will have everything u need for a perfect holiday. you only need your clothes and food the rest is there. Close to beach as well as shops. Good family place to stay. plenty of space in the backyard, inside the house everywhere. We will definitely visit again. We're pleased you were happy with the property. Your comments are greatly appreciated. We look forward to your next visit. The Madera Beach property has excellent fixtures and fittings. Plenty of room for a large family or several generations. We had a great weekend at the property. My partner and I stayed here with our four children (aged under 5) and had a fabulous stay! Plenty of space, spotlessly clean and beautifully decorated. The yard was fantastic and walking distance to the beach was a bonus. FANTASTIC!!!!! Not just equipped to sleep nine people but also easily accommodates nine people. Places for nine people to sit down for dinner, more than enough glasses, mugs, storage space, outdoor seating, cooking utensils etc. This house was exactly what we needed. It is really well set up, very spacious and in a good location. Excellent for 2 families. We loved! we can highly recommend the property. It was large enough to house family of 10 people easily.it was kept to a high standard and was in a fantastic location close to the ocean.We would definatly stay there again.